Sir, I have the honor of informing you that I have arrived in this port with a commission from the Supreme Government of the United Provinces of the Rio de la Plata to take possession of these islands on behalf of the country to which they belong by Natural Law. While carrying out this mission I want to do so with all the courtesy and respect all friendly nations; one of the objectives of my mission is to prevent the destruction of resources necessary for all ships passing by and forced to cast anchor here, as well as to help them to obtain the necessary supplies, with minimum expenses and inconvenience. Since your presence here is not in competition with these purposes and in the belief that a personal meeting will be fruitful for both of us, I invite you to come aboard, where you'll be welcomed to stay as long as you wish; I would also greatly appreciate your extending this invitation to any other British subject found in the vicinity; I am, respectfully yours. Signed, Jewett, Colonel of the Navy of the United Provinces of South America and commander of the frigate Hero'na. It is thought that Jewett's claims may well have been based on the motive of salvage. Just a few months earlier, a large French ship the Uranie had foundered at the entrance of Berkeley Sound and it was thought that he wished to claim this as his prize. This was the view of the Antarctic explorer James Weddell who happened to be on a ship in the bay at this time. On leaving the sound, Jewett took an American schooner Rampart as a prize. This incident caused a serious diplomatic incident between Buenos Aires and the United States government and played a role in American hostility towards the United Provinces and their claims on the islands in the near future. It may well be that the painting refers to this action rather than the arrival of the Heroina. Jewett would be relieved of his command just two months later. What is interesting about the accounts and the picture is just how busy the islands were in a period where it was supposedly uninhabited. It was obviously a well regarded stopping off point for the fishing fleets, sealers and explorers of the day. 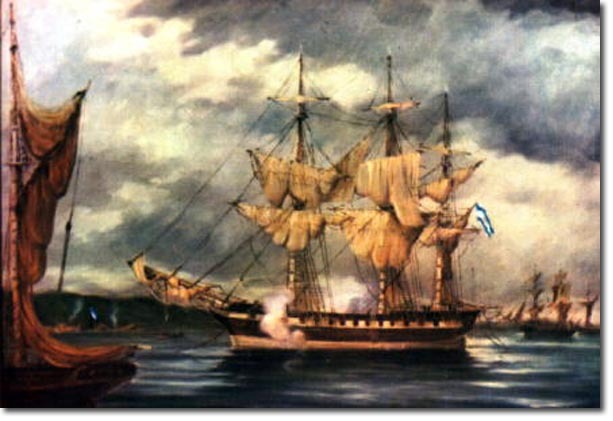 This particular picture was painted by Emilio Biggeri and is exhibited in the Museo Naval de la Naci'n, Tigre, Buenos Aires, Argentina.